For the last decade, mezzo-soprano Elīna Garanča has been one of the most captivating artists on the Met stage—from her searing portrayal in the title role of Bizet’s Carmen to a charming appearance as Octavian in Richard Strauss’s Der Rosenkavalier. 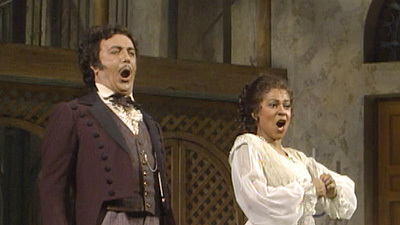 Her 2008 debut run at the Met was no exception, when Garanča wowed audiences as the feisty Rosina in Il Barbiere di Siviglia. Bringing both a smoky timbre and velvety richness, her Rosina is as lovable as she is resourceful, and the mezzo-soprano is joined by a cast of bel canto specialists. As Figaro, the title barber of Seville, Franco Vassallo offers a commanding performance with his agile baritone. Tenor José Manuel Zapata sings with a bright, penetrating sound as Count Almaviva, the nobleman after Rosina’s hand, and the robust voices of Bruno Praticò as Dr. Bartolo and Peter Rose as Don Basilio, round out the winning cast. 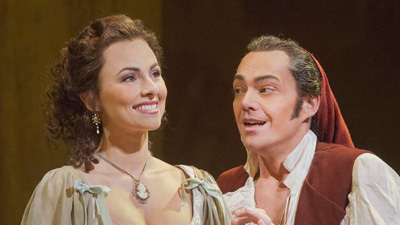 Frédéric Chaslin is on the podium to conduct an energetic performance of this quintessential operatic farce.